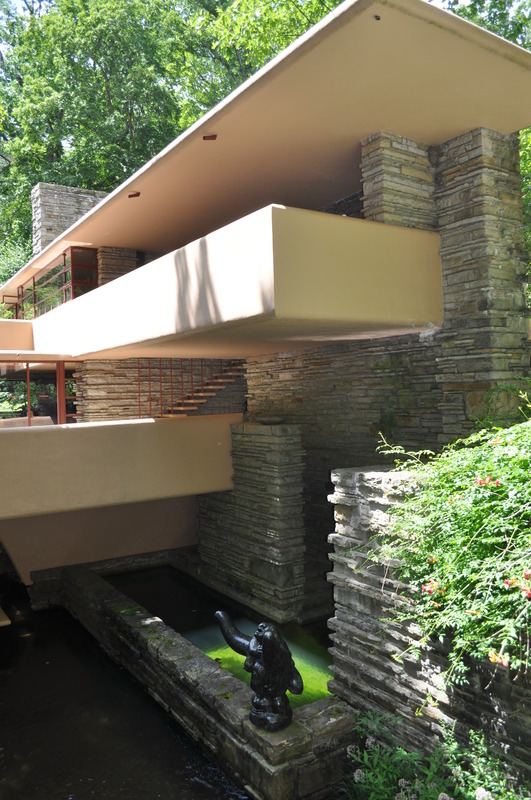 Frank Lloyd Wright’s Fallingwater is one of the architectural wonders of the world. 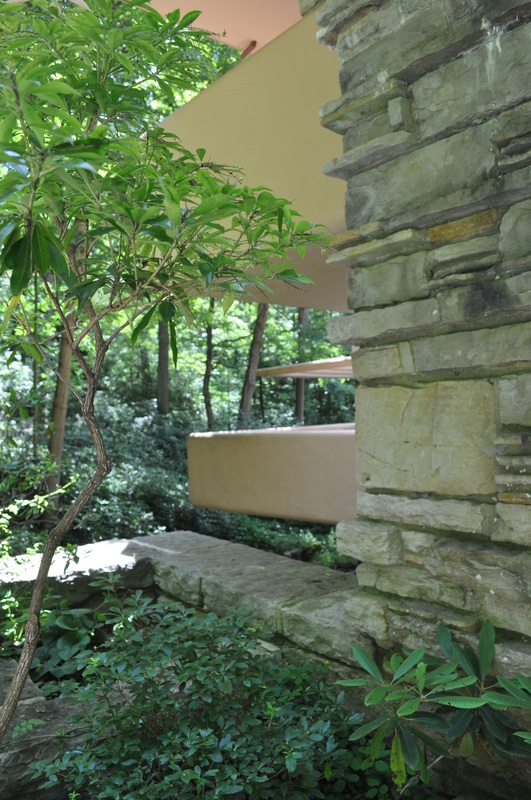 In the midst of the depression, when the Kaufmann family of Pittsburgh commissioned Wright to design their vacation home along Bear Run in the mountains of southwestern Pennsylvania, they envisioned a location that would give them a view of the beautiful 30′ waterfall that ran through their property. However, as the world soon discovered, Wright – who was then in a period of critical decline among architectural critics and the public – saw things differently. The results immediately captivated the country when the home was featured on the cover of Time magazine in 1938, and it hasn’t stopped attracting visitors and attention since. Our family is no different. After a business trip to the National Historic Landmark in early May 1998, I immediately booked a return trip a week later with Candice and our twins – Andrew and Claire – who were five years old at the time. Both children were eager to see this place that mom and dad described with such wonder and reverence. When we arrived, we found that children under the age of six were not allowed on the regular tour. At that time the site had a children’s supervised play area where Andrew and Claire colored and played with Wright building blocks, and then after our tour we walked them all around the outside of the house and up to the guest house and servants quarters. Although the site’s director – who is a friend – was not in at the time, the staff gave the children a tour of their offices located in the servants quarters, which we reminded them were not on the regular tour. We ended up by taking the photo of Candice and the twins above that has long sat on my desk at the office to remind me of my twin passions (no pun intended) of family and preservation. Fast forward 15 years. 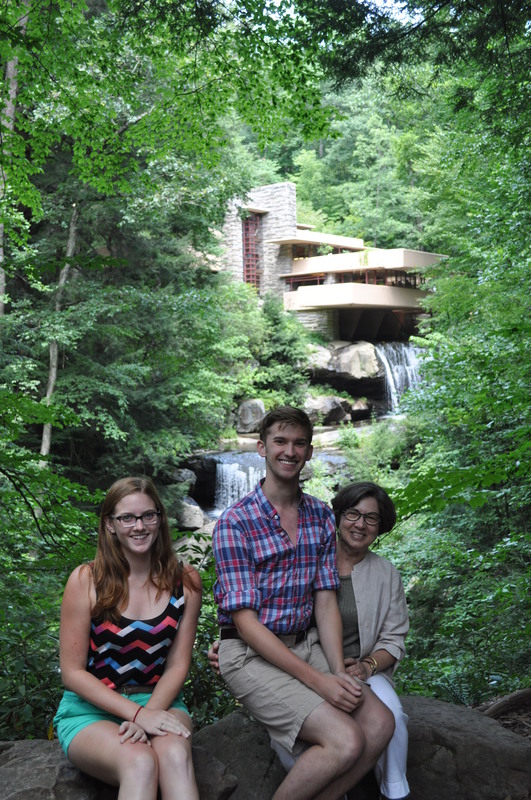 We had scheduled a family weekend in Pittsburgh and added a stop at Fallingwater on the drive home. Andrew was now an urban studies major in college who spent last summer studying modern architecture and was eager to see this Wright masterpiece inside and out. Claire’s love of nature has never abated and she was eager to learn more about the conservation work of the Western Pennsylvania Conservancy. 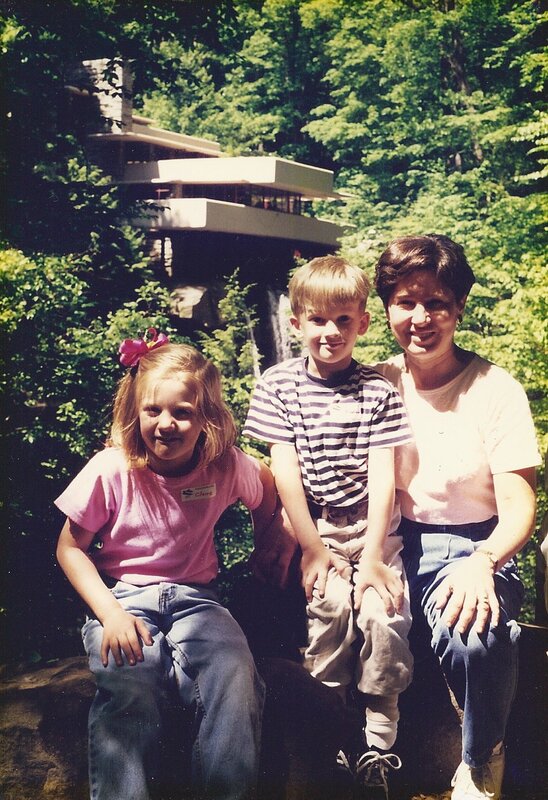 Candice and I…well, we still think Fallingwater is one of the great places on earth. We arrived on a picture perfect Monday morning – low humidity, temperature in the low 80s, clear skies – and spent almost three hours at the home. 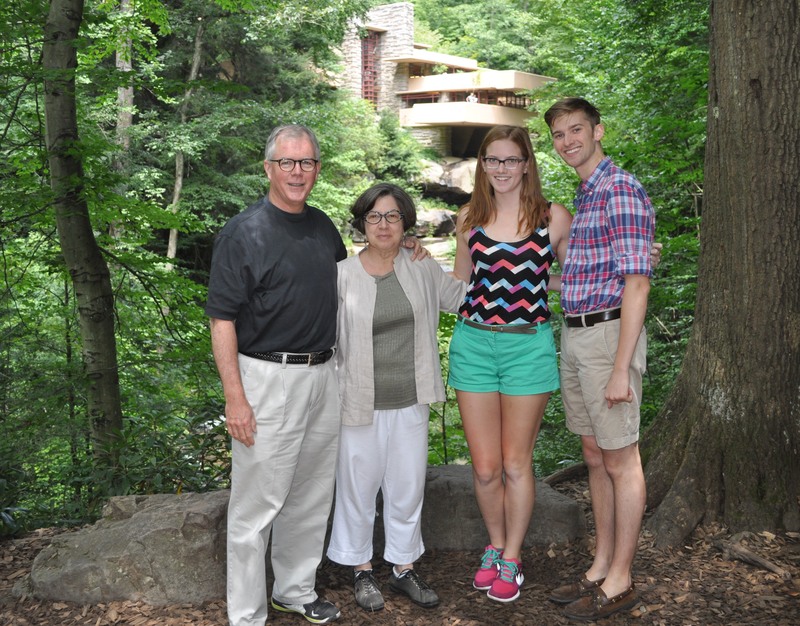 We had a great tour (my experience is that virtually all the tours at Fallingwater are professional with knowledgeable guides), followed by a short visit with Lynda Waggoner, site director and VP for the Western Pennsylvania Conservancy which owns Fallingwater. It was great to hear about – and see – the strides the site has made in 15 years. 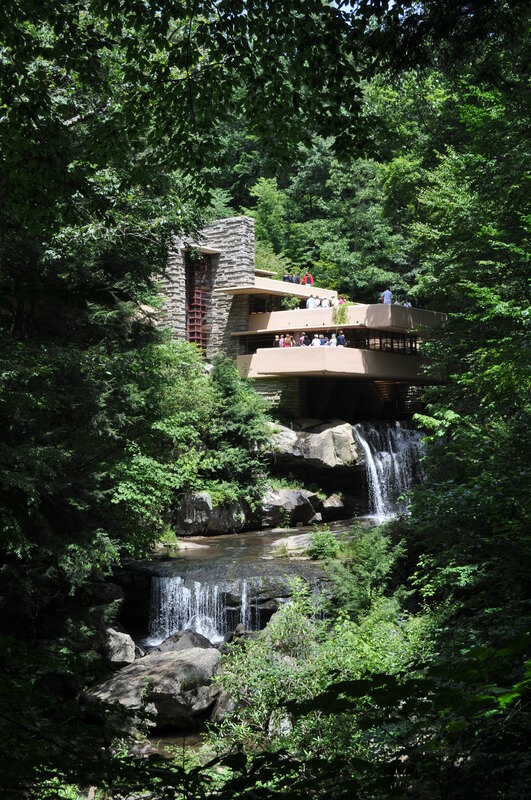 (Fallingwater welcomed its 5 millionth visitor earlier this year.) We enjoyed lunch outdoors at the cafe, and spent time (and money) in the wonderful shop. And this time, I made the family portrait. After recreating the shot above, a kind gentleman offered to take one where I was included. When he heard why we were so particular in posing the first one with just the three of us, he said, “I’ll see you back here in 15 years.” Now that would be a great story! Enjoy the photos and – if you are ever in the area, stop and see the real thing. 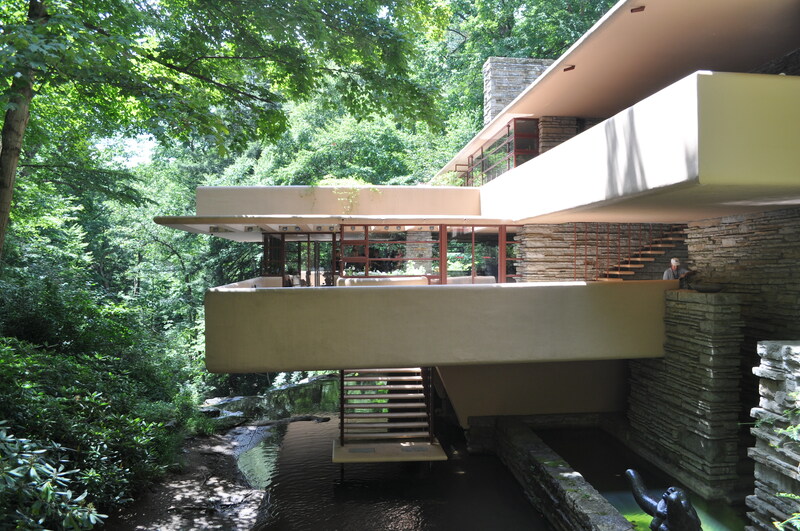 Fallingwater should be on everyone’s bucket list!